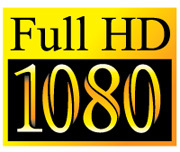 1080i is the shorthand name for a combination of frame resolution and scan type, in the domains of high-definition television and high-definition video. The term 1080i assumes a display aspect ratio of 16:9 (widescreen), implying a frame resolution of 1920 pixels wide by 1080 pixels high (1920×1080). The i stands for interlaced scan. A frame of 1080i video consists of two fields which resolve to 1920×540 pixels each, and whose horizontal lines are intertwined (that is, interlaced). 1080i differs from 1080p, in which the p stands for progressive scan. In native or pure 1080i, the two fields of a frame correspond to different instants (points in time). This is true for interlaced video in general and can be easily observed in still images taken from fast motion scenes, as shown in the figure on the right. However, when, for processing or broadcasting purposes, 1080p material at 25 or 30 frames/second is converted to 1080i at 50 or 60 fields/second, respectively, both fields in a frame do correspond to the same instant. The field-to-instant relation is somewhat more complex for the case of 1080p at 24 frames/second converted to 1080i at 60 fields/second, as explained in the Telecine article. The field rate of 1080i is typically 60 Hz (i.e. 60 fields per second) for countries that use or used System M as analog broadcast television system (such as United States, Canada, Japan, and most of Latin America), or 50 Hz for regions that traditionally used television systems with 50 fields/sec rate (such as in Europe, Australia, much of Asia, Africa, and part of Latin America). Both field rates can be carried by major digital television broadcast formats such as ATSC, DVB, and ISDB-T International. The frame rate can be implied by the context, while the field rate is generally specified after the letter i, such as "1080i60". In this case 1080i60 refers to 60 fields per second. The European Broadcasting Union (EBU) prefers to use the resolution and frame rate (not field rate) separated by a slash, as in 1080i/30 and 1080i/25, likewise 480i/30 and 576i/25. Resolutions of 1080i60 or 1080i50 often refers to 1080i/30 or 1080i/25 in EBU notation. 1080i is directly compatible with some CRT-based HDTV television sets on which it can be displayed natively in interlaced form, but for display on modern progressive-scan LCD and plasma TV sets it must be deinterlaced. Depending on the television's video processing capabilities, the resulting video quality may vary, but may not necessarily suffer. For example, film material at 25fps may be deinterlaced from 1080i50 to restore a full 1080p resolution at the original frame rate without any loss. Most UK HD channels on satellite, cable, and terrestrial platforms including BBC One HD and ITV1 HD broadcast in this format. In the United States, 1080i is the preferred format for CBS, NBC, and The CW, though some affiliates (especially those that broadcast two digital subchannels in HD) do broadcast in 720p. FOX and ABC/ESPN broadcast in 720p; many ABC affiliates owned by Hearst Television and Belo Corporation air their signals in 1080i and upscale ABC programming for master control and transmission purposes, as most syndicated programming is produced in 1080i and must be additionally downscaled to 720p.